Among contemporary Ugandan artists, Paul Ndema has one of the most distinct and recognizable styles. He paints vivid scenes in oil with vibrant patterned backgrounds illustrating african kitenge cloth. 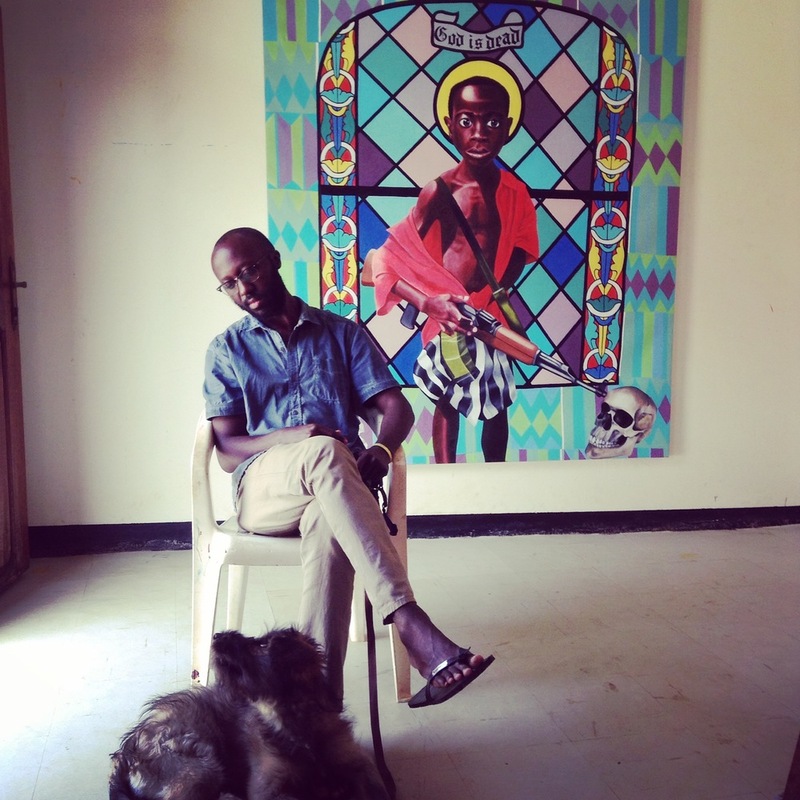 His work is easily recognizable through the recurrent use of self portrait and the subject matter addressing politics, religion, cultural identity and sexuality, all within the Ugandan social context. He approaches his subjects with subtle satire, sometimes with blatant humour, and often with tongue-in-cheek commentary about Ugandan society. Over the years, Ndema’s work has delved deeper into symbolism resulting in rich, timeless work. His painting King of the Underground is an intersection of Egyptian mythology and Christian beliefs. It depicts a black Jesus who lies interred and is delivered in the style of stained glass saints. A hieroglyphic vulture representing Nekhbet, the goddess of heaven, flies over his head carrying a shen ring that symbolizes eternal encircling protection. The painting is a deep, open-ended dialogue about African mythology, history, and religion. Ndema draws no conclusions in his work and only poses questions. Though the questions are uncomfortable for his audience to ask and answer, they attempt to return a sense of perspective to society, achieved through admirable technical skill and a wicked sense of humor. Paul Ndema was born in Mbarara, the Western region of Uganda. He studied at the Margaret Trowell School of Industrial and Fine Arts, Makerere University graduating in 2002 with Bachelors in Fine Arts. Ndema’s recent group exhibitions include: Kampala Contemporary, Circle Art Gallery, Nairobi (2016) and East African Encounters Exhibition, Circle Art Gallery, Nairobi (2014). He has also shown at Cape Town Art Fair (2016, 2015), AKAA Contemporary Art and Design Fair, Paris (2016), 1:54 Contemporary African Art Fair (2016) and Kampala Art Biennale (2014). He has participated in Circle Modern and Contemporary Art Auction, Nairobi (2015, 2014). Paul Ndema lives and works in Kampala.